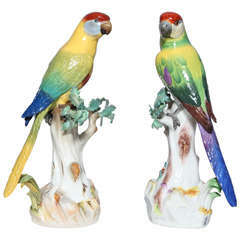 A fine pair of antique Meissen Porcelain figures of colorful parrots, each standing on a tree branch after a model by J. J. Kandler. One parrot is eating fruit while the other parrot bearing beautiful leaves on its branches is glaring into the distance holding a cherry in its beak. On each branch are beautiful leaves, Caterpillars, snails, and flowers. Each having a Meissen cross swords under-glaze blue mark and incised model numbers underneath. From an extensive and important lifetime collection of Meissen Porcelain. Incised numbers 20, 130 and 20 x, 121 circa mid-late 1800s. Measurements: H 12" W 6" D 5". 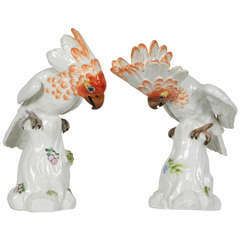 A very impressive pair of 19th century Meissen parrots, each decorated in wonderful bold colors and perched on tree stumps, one with cherries in its claw. German Meissen Blanc de Chine style porcelain figures of courting couple in Colonial garb, crossed sword mark on base, circa 1880. Measure: 9.5" H x 5.5" W x 3.5" D.